Alaska -- where to start? The state is 2.5 X bigger than Texas with only 660K people. Only 4 main roads throughout the state, and maybe the biggest fish in the world. The sun rises in the north and sets in the north, kids were water skiing on the lake behind the lodge we stayed at around 1:00 AM ... it's still light out ... 'bout the same as 7:00 PM during summer in Calif. Temps were in the hi 40's to lo-50's around 5AM, then warmed to hi 60's-lo 70's during the day. The word beautiful does not describe how mind blowing it is. Literally, it's tropical like the Hawaiian Isles with ferns, etc, that survive the winters (-40F) and bloom during the summers. Summer only lasts from mid-June through August, the a brief fall till mid-Oct, then winter and darkness 24hrs/day till April. Moose are everywhere with huge ( I MEAN HUGE!!!) antlers, and the Kenai River is apparently the river that has the largest salmon ever recorded returning each year. 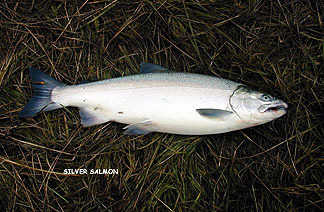 These salmon typically return to the river either on a 4, 5 or 7 year cycle. The fish this year were on a 7 year cycle, and BIG doesn't do them justice. These King salmon are just flat AWESOME, AWESOME, AND AWESOME. 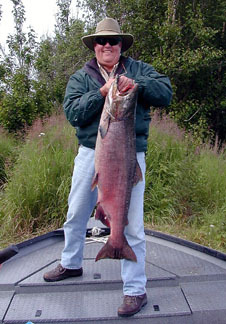 The sockeyes/reds and silvers in the Kenai are absolutely magnificent, bigger than most King salmon anywhere else. I certainly had beginners luck, limiting out on all species we fished for ... although it went down to the wire on the Kings ... caught & landed my 2nd with about 3 minutes to go before the guide had to head for shore. My 2nd King was only 38#, but some people fish for years before they get even one Kenai King, and I hooked 4 and landed 2 in two days of fishing. The sockeyes were unbelievable ... 12 - 18 pounds with the attitude of a Rogue 1/2 pounder ... except more agile, flipping circles in the air, running up stream and then down stream stripping out all your line (I used my 6 wt for sockeyes and 8 wt for the silvers ... used spinning gear with salmon eggs and sometimes plugs for the Kings). Sockeyes don't eat and so you can't catch them "normally" with a fly or spinner ... you "line" these guys by snagging them, and you're only allowed to keep the ones that are hooked in the mouth, not in the gill, tail, etc. Many sockeye die since they are hooked through the gills, but, life goes on. I caught 6 sockeye to 18 pounds, and then, on a flyout, caught my limit of silvers (3) plus three more for the guide, for a total of 6. They were in the same weight class as the sockeyes.... which just goes to show you that the Kenai fish are "huge" for their species. Went deep sea fishing for halibut on Monday, got skunked, the whole boat was skunked ... but on our last day in the Kenai, we went for Halibut again at 4AM and I caught 4 ... small ones, (see picture), but had to give 2 away to others in our group that didn't fare so well. Each of the 4 of us shared our fish, and the lodge cleans, filets, shrink wraps and flash freezes, packs the fish for shipping and guarantees the fish to still be totally frozen for 24 hours to get them home. Alaska Air shipped (1) 80# box and one 40# box for me .... and finally, when I arrive at the Bend airport, only got the big box of salmon, I think Julie and I saw the guy who stole my box with all the halibut. Son of a B, was I pissed and I still am. Hopefully Alaska will give me some kind of settlement, don't know yet. Anyway, here's a couple of pics to whet your appetite! ... it is expensive (about $2k) but maybe the most unbelievable fishing experience ever.